We chose not to lift out this year but to dry out and do it all against the wall. I took the train on Tuesday morning, to take the afternoon HW to moor up to the quays. Dried out somewhere after 15:00 to float again at 23.40. I expected to ground again at 3:25 that night and had to ensure there was suffient distance between the boat and the quay wall, so I could get around the boat with the pressure hose the next morning. That meant up in the middle of the night and push the boat off just before the grounding. We touched the bottom at 03:45 in 5.45 m water. I woke up to a glorous morning. The 1st thing in the morning was to use the harbour master pressure hose to clean the barnacles off the hull. 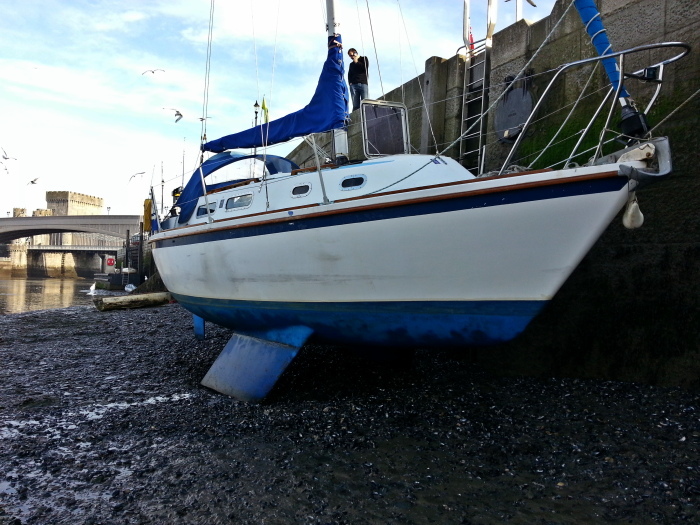 The tide was coming in then and the antifoul would have to be done at the next tide. My original plan was to go to Deganwy, but that would mean no shower, toilet and having to motor back in the pitch dark to the pontoon mooring. 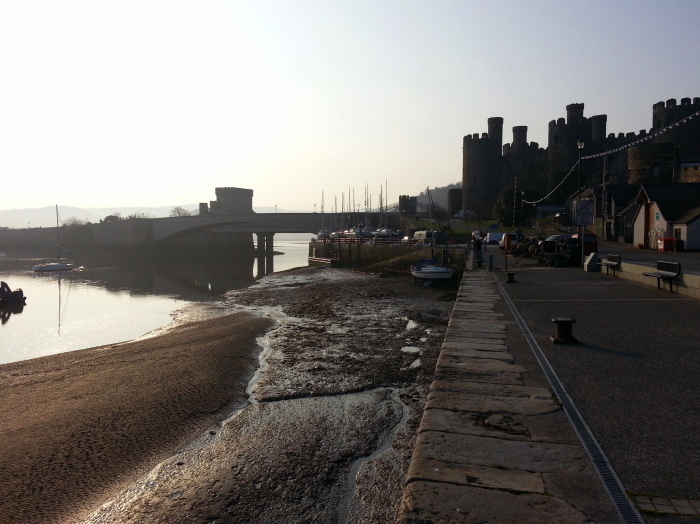 I was going to get dirty on my back and at least in Conwy I had running water. As Anyway dried out that afternoon, I found myself crawling on my back in the mud and rotting mussels for an hour to get the antifoul. The delivery of a new pot had been too slow. The logbook told me I used about 1.5 liter for one coat and the left over from last year just managed to do the job. How lucky. Took a shower in the NWCC and had a drink later. After some more varnish work in the morning, I took the afternoon HW to get back to our pontoon at 13:15. There was however a nice wind blowing from the North. I prepared therefore the boat for going to sea at set off at 13:25 for an afternoon sail. The sails went up near Perch at 14:00 after which the wind disappeared. The weather continued to be beautiful sunshine and I sailed down channel on a beam wind (F1). As I turned back the wind moved to the East and I had to tack. Near Conwy we got a bit more wind and sailed on the Genoa into Conwy river to back on the mooring at 15:35.